EDITOR’S NOTE: While Devon Baxter takes a much-needed hiatus from his regular Wednesday column, industrial animation specialist Jonathan Boschen fills in the first few weeks with several posts about Jam Handy commercial films. This week Jonathan goes “Down The Gasoline Trail” (1936), Part 1, showcasing technical animation highlights from Rockwell Barnes’ ‘Direct Mass Selling’ films. 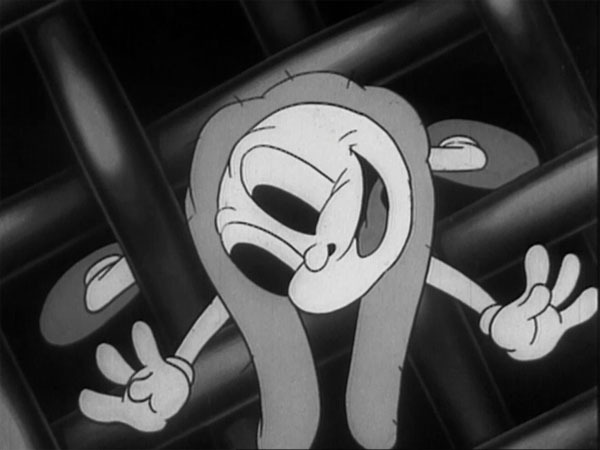 While A Case of Spring Fever and the Nicky Nome Technicolor Chevrolet cartoons are often discussed by many fans of the Jam Handy Organization, one particular animated film from the studio that has been largely overlooked and deserves more recognition is the unique 1936 cartoon Down The Gasoline Trail. The cartoon was produced as an entry for the ‘Direct Mass Selling’ program the Jam Handy Organization was making for the Chevrolet Division of General Motors Corporation and was directed and animated by Rockwell Barnes. 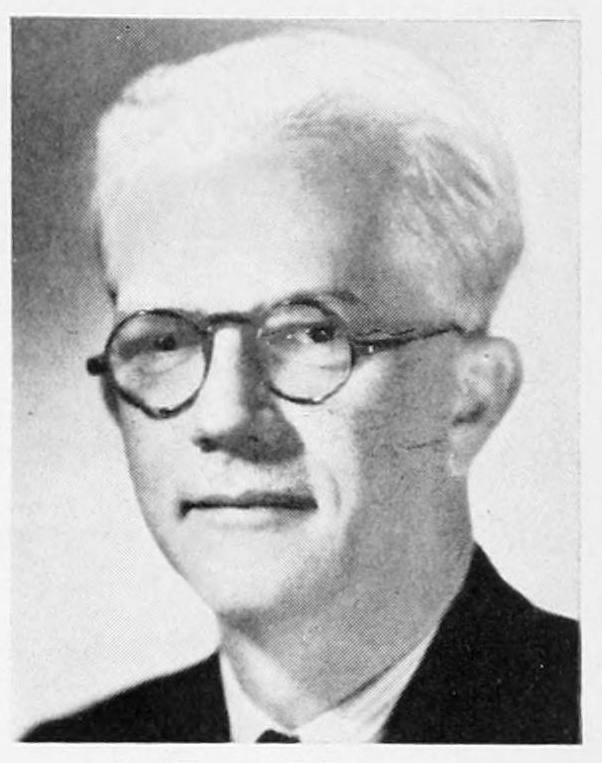 Barnes was a huge contributor to the success of Jamison Handy’s company throughout the 1920s and up to his death in 1954, as he was responsible for all of the highly detailed technical animation and drawings seen in the studio’s films many of which were credited by trade magazines and journals for “visualizing the invisible” and being “photography faithful”. In some cases Barnes was also the visionary and animator behind some of the studio’s cartoon character creations, as can be seen in Down The Gasoline Trail. Rockwell Barnes, the visionary behind “Down The Gasoline Trail”. The cartoon was registered for copyright on March 23, 1936, completed on June 6, 1936, was issued as a June or July scheduled release in the ‘Direct Mass Selling’ program (a program which will be discussed in larger detail in my next article for Cartoon Research). To be simple, ‘Direct Mass Selling’ was a short subject format film program created by the Jam Handy Organization in 1935. It’s intent was for Chevrolet dealers to stir up interest and conversation towards Chevrolet automobiles, through public film exhibitions at movie houses and non-theatrical exhibitions at community club meetings, school auditoriums/gymnasiums, etc. Subject matter of these films often highlighted certain parts of an automobile or common interest topics that could be linked to Chevrolet in some manner. Advertising was kept to an extreme minimum through product placement and narration hinting at Chevrolet’s superiority. Down The Gasoline Trail was the first animated cartoon for ‘Direct Mass Selling’ and it’s concept was the first and only of it’s type to ever be made for the program. According to trade ads it was a cartoon that was unlike anything that had been produced for the general public before, as the film used a cute cartoon character to take the viewer on a ‘photography faithful’ tour through part of an automobile engine, impossible to see by the human eye or even a motion picture camera. “Down The Gasoline Trail” as advertised in a post-WWII era film catalogue from Jam Handy. The film was stated to “show the inner workings of the fuel system in a way the student will never forget”. To briefly breakdown the film, it follows the journey of an animated “dapper little Mr. Octane” gasoline drop, who travels through the gas line of a Chevrolet automobile starting from the gas tank, traveling through the fuel/gasoline pump, the carburetor, the manifold, to one of the six engine cylinders and finally out the exhaust line. The technical drawings depicting all of these parts are beautifully detailed showcasing Barnes’ elaborate ‘visualize the invisible’ craftsmanship found in his work. 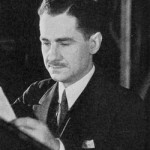 The entire tour of Mr. Octane is accompanied by an original score by film composer Samuel Benavie which captures the complexity of journeying through the gas line, and is described in just enough detail by Lowell Thomas. Nicely shot live action photography also accompanies the film in appropriate spots. The overall film itself is clever from both a content and advertising perspective, that plays out as a normal theatrical cartoon short and not as an advertisement. Not once is the name Chevrolet mentioned by Lowell Thomas, and instead throughout the tour his narration only hints at Chevrolet’s superiority by emphasizing several strong key points. For instance during the beginning, which features a live action shot of a motorist pouring gas into the tank (located in the rear of the car) located next to the Chevrolet logo-ed spare tire, Thomas makes the remark “How many know what happens to the gas after being poured into the gas tank or realize the care that Motor Car engineers have taken to give each drop an equal chance to do it’s duty”. As Mr. Octane goes through the gas line, Thomas describes briefly how each part of the gasoline process has been scientifically engineered to get the most economy out of each individual drop of gasoline. The end of the film recaps’ Mr. Octane’s journey and Thomas’ message by stating “Thanks to the engineers, he [Mr. Octane] has given a perfect account of himself, and has lived a more fortunate life than lots of other drops” with shots of the drop happily flying out of the exhaust to gasoline heaven, followed by live action shots of the Chevrolet driving off accompanied by peaceful music. It’s difficult to say how the film originally went over with audiences in the 1930s however its been hinted by advertisements and trade articles written years and even decades later that it was positively received. 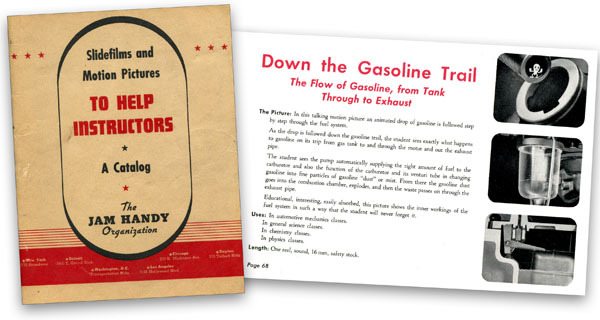 Long after it’s original releases in 1936 the film was still being offered by both Chevrolet and Jam Handy to schools and shops as a visual aid for teaching students how a four cylinder automobile engine’s gas line worked. Even into the 1950s ads for the film never hint at it being dated and instead spoke of it being an effective educational aid that “shows the inner workings of the fuel system in a way the student will never forget”. 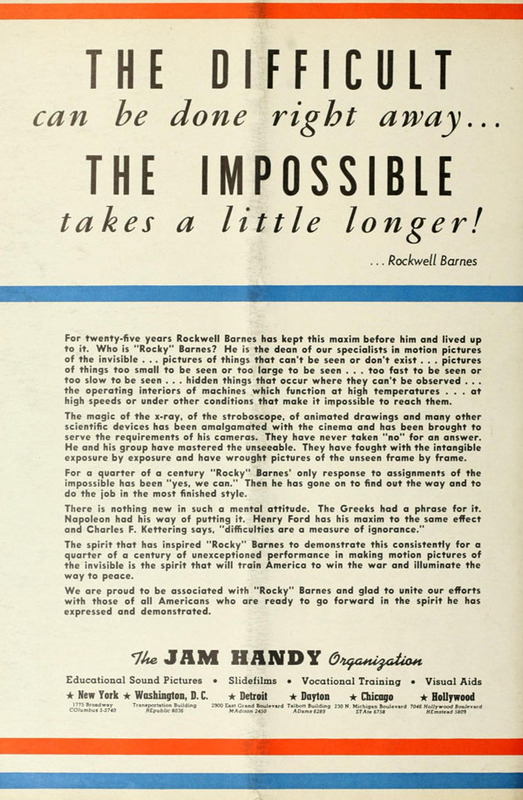 A Jam Handy trade ad from World War II, honoring and showcasing the work of Rockwell “Rocky” Barnes. 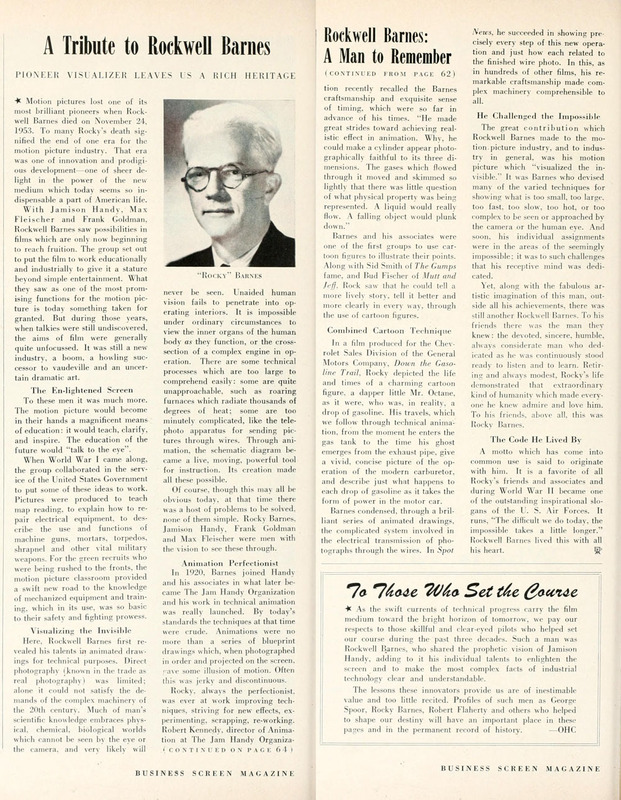 As a matter of fact when Barnes passed away in 1954, Business Screen Magazine highlighted Down The Gasoline Trail, along with 1937’s Spot News in his obituary out of all of the hundreds of motion pictures and filmstrips he worked on. 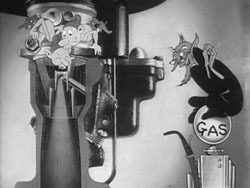 The obituary praised the cartoon for using detailed technical animation combined with an animated ‘dapper little Mr. Octane’ character to comically entertain and accurately educate people on the operation of the complex workings of a gasoline line. Despite the film’s possible positive reception, similar cartoons that gave ‘tours’ on the inner workings of a Chevrolet automobile were never really produced again for the ‘Direct Mass Selling’ program. This doesn’t necessarily mean that the cartoon flopped in 1936 as there are several reasons why this may have occurred (such as other potential subject matter being too confidential). 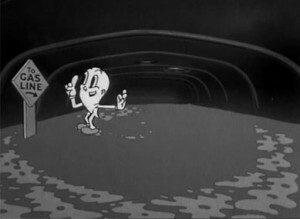 The second animated film to be made for ‘Direct Mass Selling’ was the Silly Symphony-ish styled Technicolor cartoon A Coach For Cinderella (1936/7), and instead Jam Handy took interest in producing a series of animated shorts for Chevrolet that tailgated more off of the Disney style; these cartoons would eventually spin into the notorious “Nicky Nome” series. While other Direct Mass Selling’ documentary films featured nicely made and easy to follow technical animation sequences, they didn’t feature cute cartoon characters. The closest the studio came to making a similar Direct Mass Selling’ film to Down The Gasoline Trail was an animated sequence in the 1941 film Drawing Account in which an army of animated imps successfully power a Chevrolet in triumphing over a small army of demons. The sequence features some of Barnes’ work as he was responsible for the drawings of the engine, however the ‘engine imps’ and the demons were all designed and animated by Jim Tyer. Barnes’ engine backgrounds are rather simple and quiet in comparison to Down The Gasoline Trail thus putting the focus on Tyer’s ‘engine imps’. As fun as the Drawing Account sequence is, it still does not quite capture the excitement of touring the mysterious impossible to see small world of an automobile interior the way Down The Gasoline Trail does. Outside of ‘Direct Mass Selling’ no other animated cartoons similar to Down The Gasoline Trail were apparently made again by Rockwell Barnes either. While this was the case for motion pictures, Barnes apparently directed and designed a handful of Chevrolet dealer filmstrips that did. (It should be briefly noted that Jam Handy was the lead producer of filmstrips during the 1920s through the 1950s; much of the studio’s success in this field was because of Barnes’ work). One excellent surviving example of such a filmstrip is a 1936 Safety First (Vol. 11 No. 8) in which two small ‘special’ safety inspectors tour through a Chevrolet automobile to see how it’s the “safest low price car” available. The filmstrip employs the same formula as Down The Gasoline Trail, only this time features two live action actors who are the size of one’s thumb interacting with drawings of Chevrolet wheels, parts, etc. The filmstrip beautifully utilizes live action photography of the two actors composited with Rockwell Barnes’ extremely detailed technical drawings, apparently done with a blue screen technique. In some cases where shots were impossible to include the actors, the image used is a highly detailed drawing depicting the actors and the car. A selection of frames from the 1936 Chevrolet Dealer filmstrip “Safety First” (Vol. 11 No. 8). Note the fourth frame featuring the two inspectors in scuba diving suits inspecting Chevrolet’s knee action; this scene, along with the third frame was drawn entirely by Rockwell Barnes. The final frame shows the live action actors composited onto Barnes’ drawing. Today in 2017, Down The Gasoline Trail is still praised by many, especially by classic car historians and enthusiasts. Automobile historian Kurt Ernst, a writer for the Hemmings Daily and an expert on the Jam Handy Organization, wrote an article on the film back in 2014; Ernst has praised the film for how it combines showmanship with education to effectively demonstrate how a four cylinder engine gas line from the 1930s through the 1950s works in an entertaining way. Other car historians and enthusiasts have independently echoed similar praises as well. 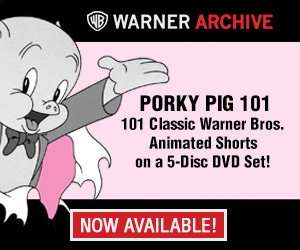 Film historians and former employees of Jam Handy, such as Ray Pointer, have spoke highly of the cartoon for how it was an effective visual aid that educates and entertains. As an added bonus here is Jim Tyer’s animated sequence to “Drawing Account” and Business Screen Magazine’s obituary for Barnes. Just wanted to say: I love the old Jam Handy educational films – of many different varieties. These 30’s Chevrolet ones have really high entertainment value for me. The music, the incredibly crisp b/w images, the layout and pacing… I love ’em. I guess part of it is that I also love these old cars. This one, the one on the differential (“Turning a Corner”, I believe), and the one on streamlining are just some of my favorites. Oh, and there’s one with Rube Golberg! But I knew nothing about Rockwell Barnes, or anyone behind the production of these. So thanks! I look forward to more. Any idea on who animated on “Down the Gasoline Trail”? It looks like Jim Tyer might have animated on this too. This is a great post, and it is nice to check out these films as there is almost no other exposure of this kind anywhere. 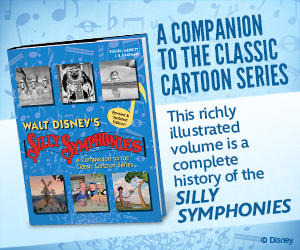 What truly makes the theatrical cartoon in general stand out is the fact that there were actual scores, produced by full orchestration, and that orchestration is usually done expressly to fit the images that you’re seeing. That sort of thing is what makes the Carl Stalling scores so interesting, but that’s all for another post on another subject. Could not agree with you more on the music score. 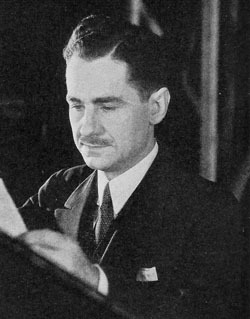 Samuel Benavie was responsible for the score and much of the studio’s other music during the 1930s through the 1960s. I should note that like Carl Stalling who was a music arranger and conductor for several theatres before composing music for cartoons, Samuel Benavie was also a music arranger and conductor for several theatres around Detroit during the 1920s.